In this part of the Java Video Tutorial, I introduce the last Swing component called the JTree. I won’t just be introducing the JTree however. I will also be reviewing much of what you have learned. It is my belief that if you see tools being used in many different ways, that you will just remember them. I will review dimensions, frames, panels, buttons, scroll bars, listeners and so much more. 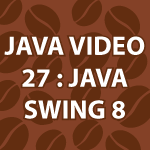 Use the code after the video to better learn how to use Java Swing. hello darek, can you please tell me how to generate reports, i mean i have to generate a report in swing, i mean i have fetch some data on panel and have to print that, how can i do this?? no actually i want to ask is that, i have a page(hard copy), which has fix header and footer(in all the pages, (hard copy)), and now i want to print report in between header and footer, the report is simple, i fetched some data from database(ie. name, age and all). how do i print that on paper?? how do i place the tree to the right? I’m sorry, but I don’t know what you mean by placing it to the right? I Think he ment align to right. so the internal file will open down to it indented to the left. and you videos are great! here i know what happens taxes.exl gets added to documents.